The picture below is a very good representation of our oldest and youngest these days. Paulie recently received a new "adult" bike for his birthday, and Finn moved up from a Skuut bike to a pedal bike this summer. They both love to ride, more than their siblings do, and especially enjoy riding down the hill in front of our house as often as possible. What I could also tell you about the photo above is that most afternoons, following school, Finn patiently rides in circles in our driveway waiting for Paulie to finish his homework and join him in jaunts down the hill. The look of barely contained excitement when Paulie finally appears in the garage doorway is thrilling to this mama's heart. That is the truth. 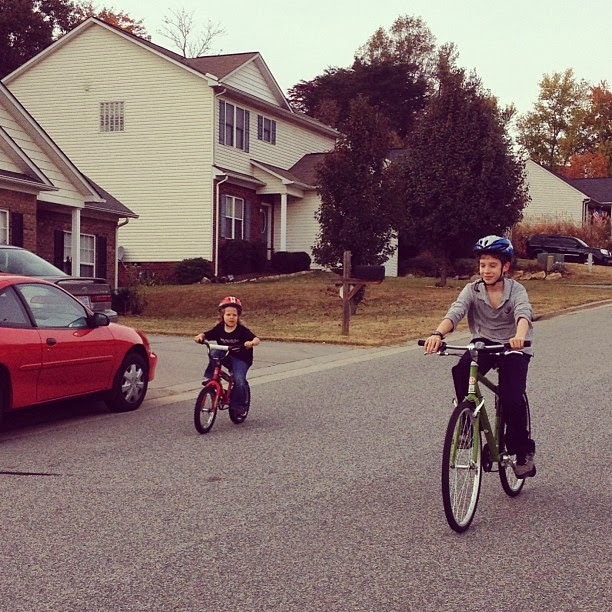 What I could also tell you about the photo above is that less than 30 seconds after I posted this photo, as they hit the bottom of the hill, Paulie whipped around on his bike and started pedaling back up the hill as fast as he could leaving Finn alone at the bottom. The unspoken, well, maybe not quite unspoken, code at our house is that you turn around and head back together. No sooner did I even realize what was happening, and I heard screams coming from the bottom of the hill, accompanied by shouts of "I'm never riding with you again!!" That is the truth. There is our family in a nutshell. Equal parts beautiful truth and ugly truth. Each moment precious for the connections and relationships that are built and maintained, whether they look lovely from the outside or not. Of course, I wish my children would get along beautifully ALL the time. But I know that these relationships are the ones they will practice with to get an idea for how to handle every other relationship that comes their way in life. If this video is any indication, they'll be just fine. Your kiddos have something very special going on. And as I know you know, they only grow stronger and closer through those ugly moments. And that music video, priceless!